Heat oil in a large skillet over medium heat. Place potatoes in oil and cook until golden brown. Place on a plate lined with paper towels and allow to drain. In a small saucepan over low-medium heat, heat chili for 5 minutes. Place fries on a serving plate. 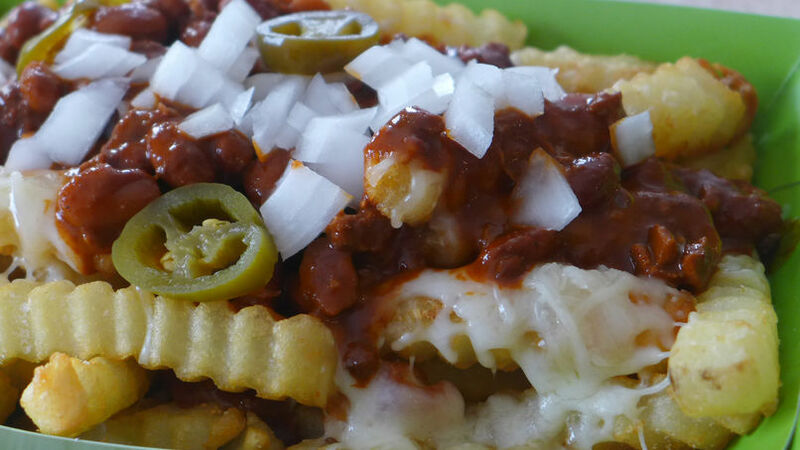 Top fries with shredded cheese, then chili. Garnish with onions and jalapeños. For a vegetarian option, top with cooked soyrizo and baked beans. You can also use frozen fries and prepare them according to package instructions. Comfort food is by far my favorite of all foods. But before jumping into junk food, it’s always a good idea to resist and make a better version at home. Chili cheese fries take me back to my high school days when we would walk to the nearest hot dog place and pick up an order. They are definitely the best treat after a long day! Once in a long while, I prepare this fun recipe for a family backyard barbecue or a picnic as we watch the children play baseball and enjoy spring.